The biblical Flood is one of the best-known stories in the Bible. But it’s not just a story. There’s evidence outside the Bible that the Flood really happened. One of the most controversial stories in the Bible is the one regarding Noah’s Flood. It is a sad story because all of mankind except eight survivors died in the floodwaters. Today many scholars and scientists dismiss this biblical account as merely a legend. Many say that the story got twisted and exaggerated down through the centuries. This article will examine some of the objections to the biblical Flood story, as well as some external evidence from cultural traditions around the world and from the geologic record. Some who claim to believe that the Flood happened don’t believe that it covered the whole earth. They suggest it was a local flood. However, scriptural and external evidence do point to a universal flood. The Bible clearly states: “Now the flood was on the earth forty days. The waters increased and lifted up the ark, and it rose high above the earth. The waters prevailed and greatly increased on the earth, and the ark moved about on the surface of the waters. And the waters prevailed exceedingly on the earth, and all the high hills under the whole heaven were covered. The waters prevailed fifteen cubits upward, and the mountains were covered” (Genesis 7:17-20). Some skeptics advance the argument that the Hebrew word erets refers to a country or territory, not the entire earth. They quote scriptures such as Genesis 10:10 (“land [erets] of Shinar”) and Deuteronomy 34:2, where erets is used to refer to the land of Ephraim, Manasseh and Judah. Actually, erets has a number of meanings, including ground, surface, the inhabitants of a land, as well as a country. However, the primary definition given in the lexicons is earth, meaning the whole earth (see The New Brown-Driver-Briggs-Gesenius Hebrew-English Lexicon and The Complete Word Study Dictionary Old Testament). The only verses that use erets prior to the Flood account are in Genesis 1. (See verses 2, 10, 11, 12, 24.) Clearly these refer to the whole earth, not a country. Genesis 8:9 states, “The waters were on the face of the whole earth” (emphasis added throughout). The Bible provides another indication of the universal nature of the Flood when it states that the ark landed in the “mountains of Ararat.” The center of the district is about 6,000 feet high (The Revell Bible Dictionary, p. 83). Many don’t realize it, but most people on the earth live close to sea level. If the water was only 1,000 feet deep, it would cover much of the earth. Water always seeks its own level, so the ocean levels all over the world would increase by the same amount. The effects would not be just a local catastrophe as some have tried to suggest. It would have worldwide consequences! And the Bible clearly says it was much deeper than that. Scripture also clearly predicts that in the end time many would no longer believe in the truth of the biblical Flood. Peter writes: “For this they willfully forget: that by the word of God the heavens were of old, and the earth standing out of water and in the water, by which the world that then existed perished, being flooded with water” (2 Peter 3:5-6). The evidence indicates we are living in the end times, so we should not be surprised that many modern scholars do not believe the Flood occurred as Scripture says. Another problem for those who say that the Flood was local is the ark. Why even build an ark if you and your family could be saved by moving a few hundred miles? Lot was told to move when God decided to destroy Sodom and Gomorrah. Why would God have instructed Noah to build this giant ark if the Flood were just a local phenomenon? The story would make no sense! The ark’s design: was it big enough? The ark’s size would have easily carried all the necessary air-breathing animals that needed to be saved. “Most animals are not very large. The average size of all animals is the size of a sheep, some say a small rodent. One railroad stock car can carry about 240 sheep. This would mean that [even if there were] 40,000 animals [they] could fit in 167 railroad cars. The ark’s total capacity was 569 stock cars. The 40,000 animals would require less than 30% of the ark’s space. In other words all the animals could fit on one of the ark’s three decks. 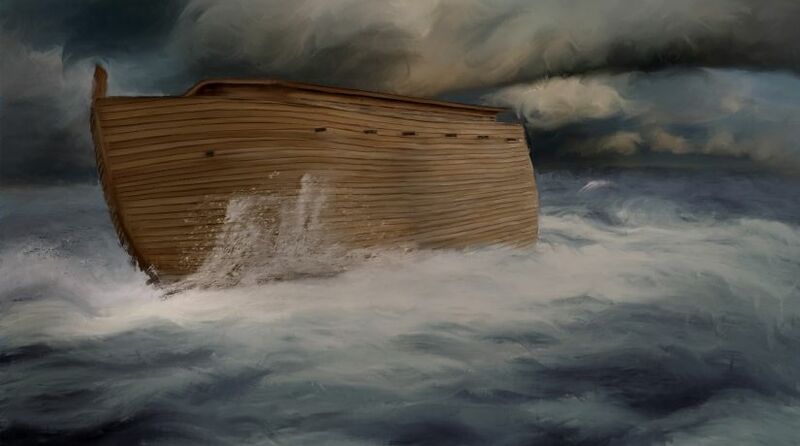 This would leave the other 70% of the ark’s space for Noah’s family, food, supplies, and baggage” (Arnold C. Mendez Sr., “The Size of the Ark”). If the biblical account of the Flood is true and humanity migrated from the mountains of Ararat after the Flood, you would expect that other versions of the story would be found outside the Bible. This is exactly what has happened. Now let’s look at some of the external evidence for the Flood. If the biblical account of the Flood is true and humanity migrated from the mountains of Ararat after the Flood, you would expect that other versions of the story would be found outside the Bible. This is exactly what has happened. Mark Isaak gathered more than 200 Flood stories in his “Flood Stories From Around the World” web page. For example, the Greeks talk about Deucalion building a chest to escape a flood sent by Zeus and sacrificing to Zeus when the rains stopped. The Babylonians tell of Atrahasis building an ark to save animals and his family from a flood sent by the gods. “When the storm came, Atrahasis sealed the door with bitumen and cut the boat’s rope.” Afterward Atrahasis made an offering to the gods. People were destroyed because they were wicked. A great boat was built. Animals were saved on the boat. A sacrifice to a god was made. There are also obvious differences because these stories were used by pagan religions to tell how their gods influenced mankind. Of all of the accounts, “only the Genesis record indicates with the exactitude of a diary or ship’s log the date of the inception of the Deluge” and many other specific details (Gleason L. Archer, New International Encyclopedia of Bible Difficulties, 1982, p. 83). Compared to other accounts, “the Hebrew account is couched in terms of sober history and accurate recording that reflect a source derived from the persons who were actually involved in this adventure” (p. 84). Can we find evidence of the Flood in the geologic strata? Today many scientists think that geology has no evidence of a universal flood just thousands of years ago. Why? Partly because of how they date the fossil record (more on that in the next section). Most people don’t think about the fact that fossils only form under special circumstances. Fossils are not normally formed today. They generally need to be buried by some type of catastrophe to be preserved in the rocks. Notice that most fossils are formed after being buried in a “watery environment.” This is exactly what one would expect to find on the earth if it were covered by water for about a year. The torrential rains, rivers and currents involved in a universal flood would have buried many of the carcasses of creatures that died in the Flood. If an animal dies normally, it is usually not buried, and no fossil is formed. So a universal flood at the time of Noah could account for part of the fossil record. For example, various geologic features give evidence of violent tidal movements that could have been caused when “the fountains of the great deep were broken up” along with the cataclysmic deluge of rain (Genesis 7:11). “Perhaps the most striking evidences of the violence of the Deluge throughout the earth are to be found in the amazing profusion of Pleistocene or Recent animals whose bones have been discovered in a violently separated state in several ossiferous fissures that have been excavated in various locations in Europe and North America. “Rehwinkel (The Flood) indicates that these fissures occur even in hills of considerable height, and they extend to a depth of anywhere from 140 feet to 300 feet. Since no skeleton is complete, it is safe to conclude that none of these animals (mammoths, bears, wolves, oxen, hyenas, rhinoceros, aurochs, deer, and many smaller mammals) fell into these fissures alive, nor were they rolled there by streams. Yet because of the calcite cementing of these heterogeneous bones together, they must necessarily have been deposited under water” (Archer, pp.82-83). Scripture records that on the second day, God separated the waters from above and below, creating the atmosphere, and on the third day He gathered the waters into seas and created dry land (Genesis 1:6-10). (For a discussion of the age of the earth according to the Bible and for biblical indications of a pre-Adamic creation, see our articles “The Gap Theory” and “How Long Were the ‘Days’ in Genesis 1?”). Why the skepticism about the Flood? Part of it is because of the dating methods that are used by geologists today. When scientists examine the fossils found in various layers of rock on the earth, they generally use radiometric dating methods to try to determine how old they are. There is evidence that some of the upper layers of the fossil record have been dated much too old. There are serious problems with the dating methods used for some of the strata. This is especially true of fossils that are older than about 4,000 years. David Rohl in his book Pharaohs and Kings says, “Israeli archaeologist A Mazar refuses to use C-14 dating for Palestinian archaeological remains of the fourth and third millennium B.C.” (p. 385). Dating methods do not supply conclusive evidence against a universal flood. Scientists now believe that catastrophes occurred in the past and one caused the dinosaurs to become extinct. There is evidence in the biblical and the geologic record that clearly indicates more than one disaster has occurred in the history of the earth, and we believe the Flood of Noah’s day was the most recent one. As we have seen, there is significant evidence inside and outside the Bible that the Flood occurred and was universal. And God gave us one more reminder as proof of the Flood and a promise He would never send a universal flood again: the rainbow! “It shall be, when I bring a cloud over the earth, that the rainbow shall be seen in the cloud; and I will remember My covenant which is between Me and you and every living creature of all flesh; the waters shall never again become a flood to destroy all flesh” (Genesis 9:14-15).